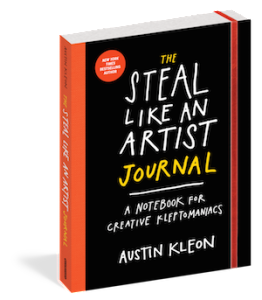 Austin Kleon’s brilliant book “Steal Like an Artist” has a companion journal with invaluable exercises to get one’s creative juices flowing with a bias towards action. As a music aficionado, I was immediately interested in the exercise: “Make a Mixtape (For Someone Who Doesn’t Know You)”. I wrote down my list and created two playlists (“Make a Mixtape Vols. 1 and 2”) in my iTunes to listen to while I work throughout the day. Hopefully you will create a mixtape of your own and share it with a friend. Are You Telling Good Stories? Remember the old adage “If a tree falls in the forest and there’s no one around, does it make a sound?” I used to think this was an absurd question (“of course it makes a sound!”), but what one approaches the question metaphorically, I have a difference of opinion. One’s creative output is like the tree and putting in the work (chopping it down) isn’t enough. One must make sure people are around to hear the sound. Show the work, explain the work, analyze the work, accept feedback on the work, learn from the work, and create new work. It’s not easy and it takes dedication, discipline, and patience, but the potential for growth and reward is great. Besides, if no one at first notices one or two felled trees, they will surely notice the clearing you’ve created if you keep on chopping! 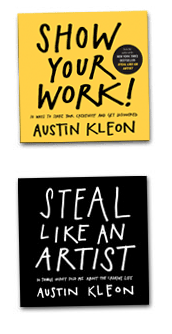 Last week on vacation I made time to read Austin Kleon’s, Share Your Work and it inspired me to revisit his previous book Steal Like An Artist one year later. 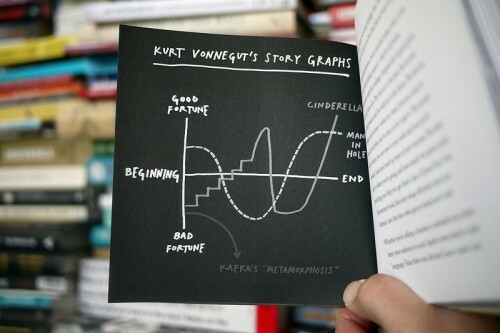 Mr. Kleon’s intelligent, humorous and straightforward observation of the creative process builds a persuasive case for starting work NOW and sharing it with others (one of my professional mentors refers to it as a “bias towards action”). These books are essential reading for any creative professional or aspiring creative. Happy Reading!